WR Richard Johnson (pictured above) had been a star for two seasons with the Houston Gamblers of the United States Football League, twice leading the Spring league in pass receptions, but, other than a brief stint with the Washington Redskins, drew little interest from the NFL after the USFL folded. There were concerns about his lack of size (5’7”, 172) and speed, but the Detroit Lions finally gave him a tryout in 1989 thanks to the arrival of Darrel “Mouse” Davis as offensive coordinator, who had held the same post in Houston. 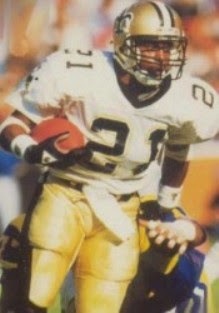 Johnson made the team and, on December 3, 1989, had an especially noteworthy performance against the New Orleans Saints. The Lions were struggling at 2-9 under Head Coach Wayne Fontes. 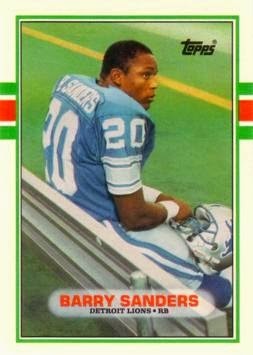 Another, more heralded newcomer, rookie RB Barry Sanders, was outstanding, and NT Jerry Ball and LB Chris Spielman were having an impact on defense. But QB Rodney Peete was suffering through an injury-plagued season and, while journeyman Bob Gagliano was familiar with Davis’ run-and-shoot offense, but was no better than a fill-in. Johnson was the best of a receiving corps that was less than exceptional. New Orleans had a 6-6 record and was trying to remain in the playoff hunt. Coached by Jim Mora, the Saints had gotten off to a 1-4 start before winning five of six games, but had lost in overtime the previous week. QB Bobby Hebert was going through a rough patch, although RB Dalton Hilliard was filling in well for the injured Reuben Mayes. On defense, the corps of linebackers was outstanding and the Saints had the NFL’s number one rushing defense, but defending against the pass was problematic. There were 38,550 fans in attendance at the Pontiac Silverdome. The teams exchanged punts until the Lions put together a nine-play, 70-yard drive. Rodney Peete completed passes to Richard Johnson for 27 yards and WR Walter Stanley for 37, and it was the quarterback keeping the ball and running six yards to score a touchdown. Ed Murray added the extra point. On the first play following the ensuing kickoff, Bobby Hebert threw to TE Hoby Brenner, who fumbled and LB Dennis Gibson recovered for the Lions. But two plays later, a high pass by Peete was intercepted by CB Robert Massey, who returned it 22 yards to the New Orleans 47. It led to a three-and-out series followed by a punt, but the Saints again quickly regained possession when Peete fumbled a snap and LB Pat Swilling recovered at the Detroit 34. As the opening period came to an end, New Orleans was moving methodically down the field and, two plays into the second quarter Dalton Hilliard ran for a one-yard TD. Morten Andersen tied the score with the PAT. The Lions moved swiftly down the field on their next series, advancing 82 yards in five plays as Peete completed passes to Johnson that covered 46 and 36 yards. Barry Sanders broke three tackles on the way to a three-yard touchdown and, with Murray’s conversion, Detroit was back in the lead by 14-7. But RB Bobby Morse returned the kickoff 99 yards, Andersen kicked the extra point, and once again the score was knotted at 14-14. After the swift exchange of scores, the teams reverted to trading punts. The Saints reached the Detroit 31 with 18 seconds remaining in the first half, but Andersen was wide to the right on a 48-yard field goal attempt and the tally remained unchanged at halftime. Peete suffered a knee injury when sacked on the second play of the third quarter and Bob Gagliano replaced him. Neither team was able to move the ball as they exchanged punts until, with the ball at their 25, the Lions came through with a big play. Gagliano threw short to Johnson at the left sideline, and he ran the distance for a 75-yard touchdown. Murray again converted and the home team was back in the lead by seven points. There was another exchange of punts before the Saints advanced into Detroit territory. Hilliard started off with a ten-yard carry that had another 15 yards added to it due to an unnecessary roughness penalty. Hilliard continued to run well and Hebert completed two passes, New Orleans having reached the Detroit 14 as the period ended. But after getting to the seven in the early moments of the fourth quarter, Hebert had a pass batted away in the end zone by CB Jerry Holmes, who nearly picked it off, and on the next throw Holmes succeeded, just keeping his feet inbounds as he came down with the ball. Gagliano threw to Johnson for 33 yards on the next play, but the Lions had to punt after reaching their 47. Once again the teams kicked punts back and forth. John Fourcade replaced Hebert at quarterback for the Saints, and while he completed his first two passes to Brenner for 20 yards and Hilliard for nine, the result was the same as New Orleans couldn’t get out of its end of the field. Tommy Barnhardt’s punt gave the ball to the Lions at their 32 with 4:11 remaining in regulation. They never gave the ball up as Gagliano completed passes of 11 and 19 yards to WR Jason Phillips for first downs and, in a third-and-eight situation with still over a minute remaining, Sanders took a handoff, started to his left, changed direction, and ran 27 yards to effectively seal the 21-14 win for Detroit. The Lions led significantly in total yards (401 to 169) and first downs (17 to 11), although New Orleans had the longer time of possession (33:47 to 26:13). Both teams turned the ball over twice, but Detroit was penalized 10 times, at a cost of 75 yards, while just three flags were thrown on the Saints. New Orleans also recorded four sacks, to three by the Lions. Richard Johnson had a huge performance with 8 catches for 248 yards that included the one long touchdown. Barry Sanders rushed for 72 yards on 20 carries that included a TD. Rodney Peete completed 8 of 18 passes for 177 yards and was intercepted once while Bob Gagliano was 6-of-13 for 166 yards and a touchdown while giving up no interceptions. On defense, Jerry Holmes intercepted a pass for the fourth straight game. For the Saints, Bobby Hebert was successful on 16 of 26 throws, but for just 99 yards with no TDs and one interception. Dalton Hilliard (pictured at right) gained 67 yards on 18 rushing attempts that included a score and also caught 6 passes for 31 yards. Hoby Brenner gained 48 yards on his four pass receptions. The win for Detroit was the second of five straight to close out the season. The Lions ended up third in the NFC Central with a 7-9 record. For the Saints, the loss effectively ended their hopes for a Wild Card playoff spot, although with John Fourcade starting at quarterback, they won their last three games to end up at 9-7 and in third place in the NFC West. 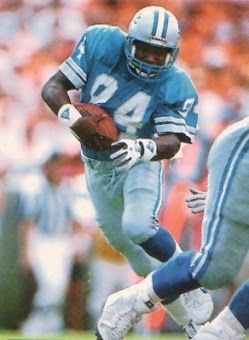 Richard Johnson led the Lions with 70 catches for 1091 yards (15.6 avg.) and eight touchdowns. Barry Sanders received the greater acclaim for his NFC-leading 1470 yards on 280 carries (5.3 avg.) and 14 TDs. He was not only a consensus Rookie of the Year but a first-team All-NFL and Pro Bowl selection as well. Dalton Hilliard went over a thousand yards rushing for the season with his performance against the Lions, and he finished with 1262 yards on 344 attempts (3.7 avg.) and caught 52 passes for 514 more yards (9.9 avg.). He led the NFL in touchdowns (18) and the NFC in yards from scrimmage (1776) and was named to the Pro Bowl.